Wolvenciel here again bringing you yet another review of a mecha/superpower anime that is NOT Gundam or the likes (though the characters do have that SEED feeling to them). This is me shedding some light into this underdog anime that no one ever heard of, Heroic Age. Now before anything, I would suggest that none of you check out the wikipedia page of this anime as it really gives you the feeling that wikipedia is saying "Guys this anime rips off that greek mythology on this and that and blablabla". It ruins the originality that you might want to see for yourself when you watch this anime. The names and a lot of things in this anime is based off those greek myths even right to the clans and the ship's name. I didn't even realize any of these until I read the wikipedia page though. The universe was created by these Tribe of Gold people who then called to other denizens of the universe out to space and find them. Naturally the more powerful of them rose to that call and made it into space and decided to go on a rampage(that's the Tribe of Hero). The Tribe of Gold then punished the whole tribe and made the last of the Heroes into servants for other tribes. The story is about what happened after the Tribe of Gold left the universe and its denizens with their respective Hero Servants (which are called Nodos). Belcross. A space titan as I like to call it. 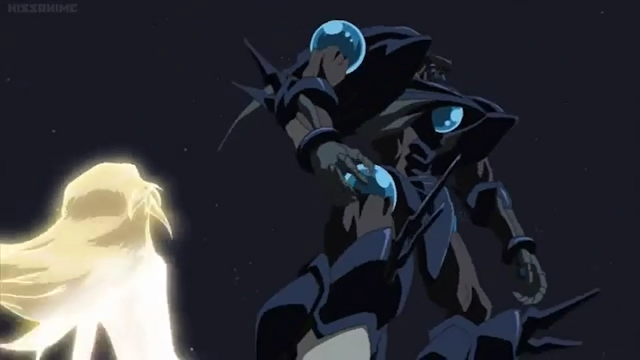 When I first watched this anime, I was impressed by the superpower+mecha theme. I know I know. A lot of mecha animes already has this theme. Its overused and its getting stale by the day. 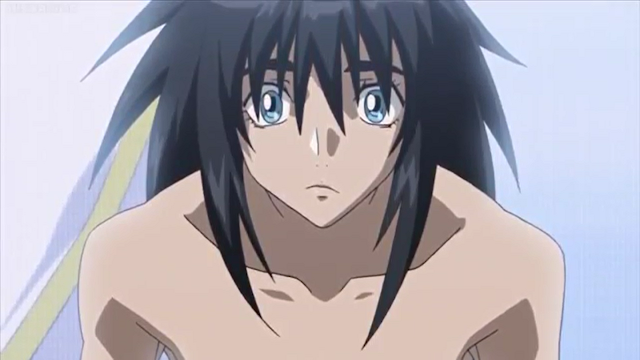 However, there was one guy whom I can't help but love eventhough he was one of these overused stereotypes. A side character that doesn't really move the story that much, Iolaus is one of those tryhards that you often see in most animes (again, overused stereotype) where they work hard but gets stomped real easy by the main character anyway. He teleports, which is pretty awesome as he used it in a lot of situations and its fun seeing him take full advantage of his powers. You also don't see those negative rivalry in this anime much as eventhough Iolaus likes the same girl as the main character, he's not idiot enough to be blinded by his own shortcomings. This guy is one of the main reasons I watched this show to the end. Thus the whole subtopic on one guy. Moving on. 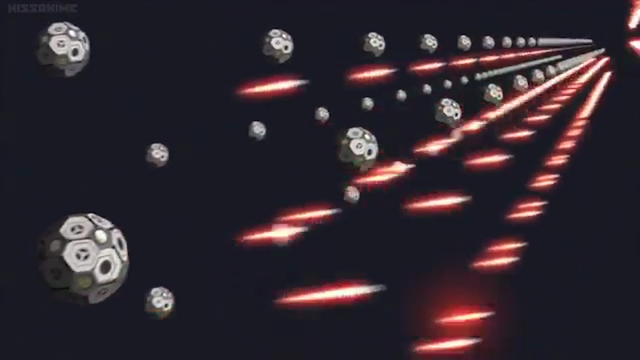 A good thing about this anime would be that it portrays how space battles work theoretically well. You have formations and you need to organize you fleets properly before entering battle (a lot of space battles in mecha animes don't do this well). There are drones and AIs to help with the defense mechanism of the ship and the battles have a hint of strategy in them instead of the usual "sortie and blast each other's head off" stuff you see (sorry, I just have too much experience in these things watching gundams). Okay. We got the positive stuff out. Now to give judgement to this anime. The first and biggest flaw to Heroic Age would be that it lacks fighting scenes that actually bear meaning to the whole story in itself, or just a battle that signifies something at the least. 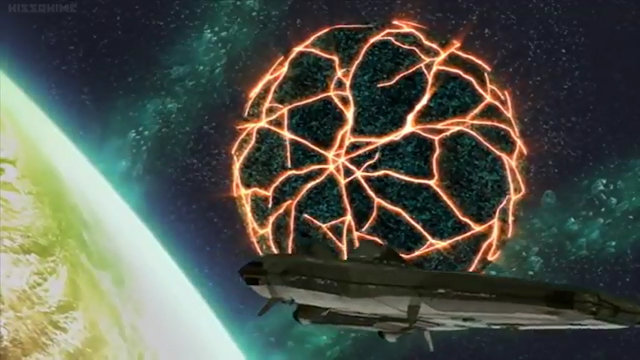 You would think that if space titans that can blast a planet into pieces fight, you'd see some good action out of it, right? Well that did not happen. Most of the fights are like repeated punching and firing beams and flying and then finishes off with the inevitable "berserk mode" of the Nodos that gets overwhelmed. 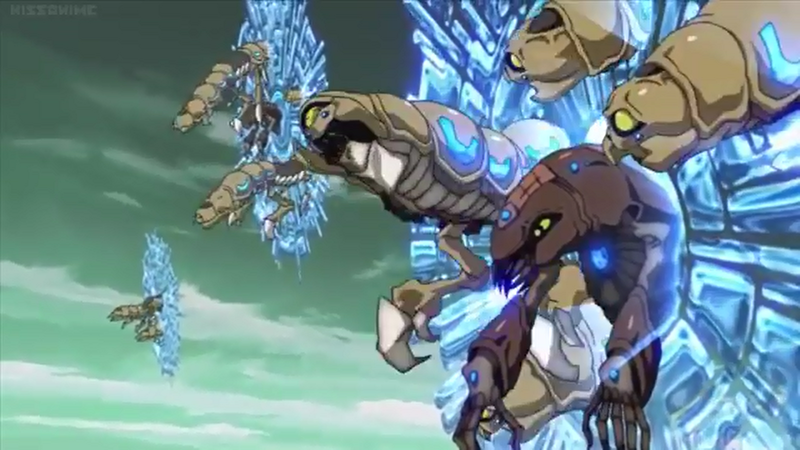 At first, I thought it awesome that each of these Nodos have the strength that reminded me of One Punch Man as Belcross technically just used shock waves of his punches to obliterate the Tribe of Bronze's ant hives. Hell I was wrong. Watching the Nodos battle it out with each other was like watching a 1v1 Tug o War. Its static and repetitive and you don't get excited because there's like only two guys playing. Ant hives are like asteroids. Filled with ants. And can do FTLjumps. I get it that this anime is more towards talking it out rather than fighting but man they discuss about stuff too much. The action wasn't really making stuff that exciting and now you give me endless discussions and talks about how beautiful the world is? A lot of times I was distracted from watching the show and decided to look at the food that I'm eating, or the clock or my phone. Yes. Its that boring. I admit that some parts of Heroic Age were pretty good but when there's too much of the bad stuff you just can't seem to bring yourself to watch the anime with passion. I'm not saying that it's all bad. Its just... sigh... I wish they'd spark things up more, you know? Heroic Age might seem like a fresh concept at first but it turns out boring as it gets to the Nodos battles as there aren't much to look forward to (except the plot, that is). If at least they did the fights right, the anime might be better in my opinion but as far as I can see, the space battles are the only thing to look forward in this anime. Oh and the opening song is a killer.